Many in the world of hockey, as well as those who have played that position, have long maintained that to be a net guardian requires a unique kind of personality. The pressure of being the last line of defense on his team often prompts him to be a loner, and, at times, nervous and testy. It is generally agreed that backstops fall into two main categories—those who rely on technique, and those who rely on reflexes. But into that mix enter individual approaches to the ice game—idiosyncrasies, if you like. It may involve subtle superstitions, reflections of nervousness, or just plain style of play. Georges Vezina, after whom the modern-day NHL goalie trophy is named, played the position in his snow boots for a number of years. In fact, he didn’t learn to skate until he was 18. Old timers recall him as almost “statuesque in his immobility”, the epitome of the stand-up netminder. It is said that his stick was as quick as lightening—that he would snag the disc on the blade or the shaft and fling it to the corners. At other times he would drop the puck to his feet, then stickhandle within the confines of his crease until a mate skated in to collect it. He also baited his opponents, by standing on one side of the cage with his stick stretched across the gap, inviting them to fire into the opening. But, quick as a flash he would slide across and deny them a goal. Strangely enough, when action shifted away from him, he would tuck both hands under his chin and lean on his stick—the favourite habit of another highly-regarded cage cop who would don the Bleu, Blanc, et Rouge some 50 years later. 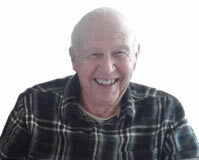 John Ross Roach was born in Port Perry, Ontario, and played his Junior and Senior shinny with Aura Lee and the Toronto Granites. He stood only 5’ 5”, and weighed in at 130 pounds. He was signed as a free agent by the NHL Toronto St. Pats, joining them for the 1921-22 campaign. He was quickly assessed as a “jumpy, crease-clearing” kind of backstop. He had a nervous habit of constantly sweeping of snow, real or imagined, away from in front of his cage. When the play moved away from his end of the rink, he also kept straightening his sweater. This combined fidgeting earned him the nickname “the Housecleaner”! He made up for his lack in size with what observers called his “feisty acrobatics”. He is given credit for being the key ingredient in Toronto’s Stanley Cup victory in his rookie season, as the Irish defeated Vancouver to cop shinny’s top prize. He had the honour of being one of the seven goaltenders in league history to be named team captain, a responsibility hung on him at the start of the 1924-25 schedule. He was not a happy camper when Conn Smythe swapped him for Lorne Chabot in 1928. And he was even less impressed when the Blueshirts sold him to Detroit in the fall of 1932. But he dug in his blades and showed both of his former clubs they had made a grave error by getting rid of him. In the spring of 1933 he was voted to the First All-Star Team, having racked up a stingy 1.88 goals-against-average in 48 games. On one occasion, although he needed knee surgery, he stood between the pipes for the Wings because no one else was available. Essentially he played on one leg, often grabbing the cross bar to maintain his balance. In the spring of 1935, the Maple Leafs owner and manager, Conn Smythe, was on the prowl for a goaltender. He made a trip to the Detroit-Windsor area to check on Earl Robertson, who was part of the Red Wings’ farm system. Inadvertently he saw a roly-poly kid from Brandon, Manitoba, working his magic in the nets for the Can Pro Olympics against the parent Red Wings in their annual “city series”. His sterling performance drove all aspirations for Robertson out of his mind. He approached Jack Adams and offered him $8000 for Walter “Turk” Broda, who, even at that point was establishing himself as a “money” player—when the chips were down, his determination rose. Certainly that devil-may-care, easy-going attitude remained his signature temperament over the years. Pressure never bothered him. Even though his one weakness was revealed in his very first match with the Blue and White (namely long shots), his happy-go-lucky deportment always shone through. One night, while Coach Hap Day was delivering an emotional pre-game pep talk, he fell fast asleep. It was said that behind the scenes he was a bit eccentric as well—that he seldom, if every finished a sentence when speaking. Following a strenuous match one night, he commented to teammate Nick Metz about a certain play: “I thought he was gonna…..” And he sat down to rest. Alfie Moore’s claim to fame is partly due to one of hockey’s fabulous fables—a mythical tale that has come to be regarded as gospel. As the 1938 NHL playoffs were in full swing, he had returned home from Pittsburgh where he had been biding his time tending goal in the minors, while officially carrying the tag of the NHL’s “spare goalie”. At that point he was contemplating his future in the game. Allegedly he was found in a pub tipping a few when he was rushed into emergency service to sub for Chicago’s Black Hawks, whose regular cage cop had suffered a broken toe. His heroics in that contest are legend. But far more distinctive about this career minor-leaguer was his style while guarding the crease. Rather than maintaining the convention backstop’s stance, he would drop his stick, crouching like a baseball catcher, trapping the puck with both hands. This idiosyncrasy came partly because he had little tutoring in the art of twine tending, and partly because Eddie Livingstone opined that his right arm was not strong enough to wield the big stick—so he told him to drop it for long shots. The theory was that this allowed him to snag the puck with whichever hand could reach the shot more quickly. Despite the fact that some argued his hands were his greatest asset, both Chuck Conacher, who wrote a column in the Globe and Mail for a time during a lengthy injury, and former goaltender “Hap” Holmes, were of the opinion he was not competent to stick it out in the Big Time. The fact that he managed only 21 NHL games over twenty years of pro shinny may just confirm that. Frank Brimsek took the NHL by storm, when the Boston Bruins promoted him from the Providence Reds early in the 1938-39 campaign. He lost in his first outing, 2-0, then earned six shutouts in the next seven games. It earned him the moniker, “Mr. Zero”. But the twenty-three year native of Eveleth, Minnesota, was a high-strung competitor, fidgety, and nervous. Outwardly he was stoical in action, prompting the press to tag him “Frigid Frankie”. But he was really a bundle of nerves. When play moved away from his crease he would work at adjusting the buckles on his pads and skate laces. Because of that he distained anything which disturbed his comfort zone. When he was called up from the AHL he insisted on bringing his red hockey pants, worn in Providence, because he liked the way they fit. While the rest of the team skated in black trousers, he stood out in the crease in scarlet. He was also finicky about his leg pads, liking the comfortable old ones, which, as one Boston scribe put it, “were held together with twine, adhesive tape, and safety pins”. His skittish nature showed up in the team dressing room. He was like a sphinx, never speaking a word, almost like he was in a trance, staring at the floor. On the ice, when the play was at the other end, or previous to face-offs, he habitually chewed on the thumb of one of his goal gauntlets. But Big Bill was unique among NHL twine tenders. He was ambidextrous. His boyhood coach taught him to use both hands for holding the stick and for catching the puck. He resisted at first, but eventually acquiesced, enabling him to cover the “far side’ of the net with his catching hand. A right-handed shot coming in from the right wing tends to shoot for the right side of the goal, covered by a goalie’s “blocker”. But Durnan switched hands, enabling him to cover that opening with his catching glove. His mitts were identical—padded on the back, but with a “loop”, flexible enough to hold a stick, yet enabling to snag a puck. It gave him a big edge in a one-on-one confrontations. There will probably never be another like him. Doubtless Glenn Hall would prefer that his idiosyncrasy were less bizarre. One of the best reflex netminders of all time—one who perfected the “butterfly” before his time—and who flopped and slid from side to side with lightning speed—he nevertheless is remembered mainly because he invariably threw up in the dressing room before every game. Sometimes he would do the same between periods as well! Despite that, he still holds the record for most consecutive games played—502, between 1955 and 1962. “Mr. Goalie” was another “sweeper”. Too young to have ever seen John Ross Roach perform—perhaps barely having even heard of him—he nevertheless imitated this one trait. Whenever there was a stoppage in play, he could be seen skimming the ice in his crease, even beyond, in wide circles from one side to the other. Johnny Bower’s biography presents him as “The China Wall”—focusing on his willingness to stop shots at all costs—even with his face, if need be. In fact when asked how he decided to be a goaltender, he answered: “I just made up my mind I was going to lose teeth and have my face cut to pieces. It was easy. 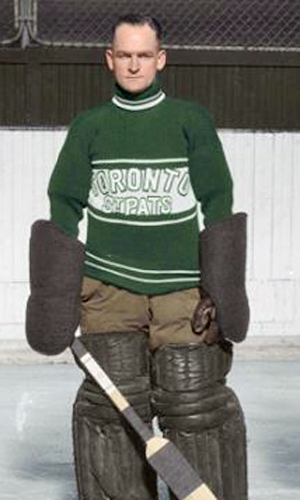 In his book “Great Goalies of Pro Hockey”, Frank Orr refers to him as “The Reluctant Goalie”. That reflects his hesitation, in 1958, to leave the security of being “in like Flint” with the Cleveland Barons of the AHL. He was a fixture with that minor league sextet, he was content living there, and his family had come to count it as home. So at age 33, when most shinny mercenaries are leaning toward retirement, he felt it was too late for him to think of furthering his career on a higher hockey plane. But he was finally persuaded by a persistent Punch Imlach to join the Leafs, and eventually played a key role in Toronto’s four Stanley Cup triumphs in the 1960’s. But he had another distinctive. Through the magic of “Classic Games in an Hour” on Leaf TV, viewers may notice his habit, previous to face-offs, of raising his stick in front of him and slashing it down on the front of his big goal pads, alternately from one to the other. Terry Sawchuk, at one time held the record for most career shutouts—at 103—but lost that honour to Martin Brodeur. Like Glenn Hall, Sawchuk introduced a new style of backstopping when he came on the NHL scene. Until he arrived, netminders normally stood erect, bending slightly at the knees. But the rookie Winnipeg native favoured a crouch position, almost bent at right angles at the waist. His philosophy was simple: he was able to move more quickly from that stance—he had better balance—and most of all he could see the puck coming, when there was a sea of legs, both of friends and foes, blocking his line of vision. At the Hockey Hall of Fame in Toronto, there are two rather imposing metal effigies. One is of the famous “Cyclone” Taylor—the other is of Ken Dryden. The latter is portrayed in his familiar posture—namely, standing with both gloved hands leaning on the top of his goal stick. As mentioned earlier—half a century before, the legendary Vezina struck the same pose during breaks in the action on the ice. The one main difference is that the “Chicoutimi Cucumber” faced the old boot heel barefaced—this lawyer-in-the-making sported an unusual, barn-owl-like mask! There are other backstops whose eccentricities are worth noting. For instance, Gary Smith, who penchant for leaving his cage and heading down ice at a whim, prompted a new rule to be struck, banning netminders from skating with the puck beyond his own team’s blueline. But he also had the habit of stripping off his equipment between each period and having a shower, before donning his armour in time to resume action. he contended, “Standing and allowing people to fire hard rubber at 90 miles-per-hour at you, is very much like being stoned!” He is best remembered for refusing to suit up for a game because the moon was not in the right phase in the sky! It is common for those holding the fort as the last line of defense to pile snow to slow the movement of loose pucks as they bounce and slide in the blue paint area. But Tony Esposito somehow managed to manufacture ice chips and pile them along the side of his cage. He became enraged if anyone disturbed them. Ed Belfour used to slide from side to side, always left to right during the warm-up period. If he was uncertain whether he made that move or not, he would dash to the locker room and have his skates sharpened again before returning to the ice. Several twine tenders found goal posts held particular attraction to them. Ron Hextall used to tap them as well as the cross bar before the start of each frame, apparently to make these spots on the iron more attractive to fired pucks than the webbing behind him. Perhaps the most unusual connection with the uprights may be attributed to one Patrick Roy, who some still claim is the best NHL twine-tender of all time. “Chico” Resch may have kissed goalposts when they proved to be “the goalie’s best friends”—but Roy talked to them. Before games he would skate out to his own blueline, turn, and crouch. He would then glare at those pipes. He always claimed he was “beaming thoughts” to them, specifically visualizing them getting smaller and smaller. Ron Tugnutt did a “figure eight” in the crease, then tapped his pads in a certain way before settling down to business. “The Popcorn Kid”, Mike Palmateer, put a new spin on eccentricities. The fun-loving lefty used to do his own “play-by-play” of the action in games in which he played—complete with a not-so-humble, “Great save by Palmateer!” So it does take all kinds. Thus, it would seem that the hockey scribe who opined: “Hockey goaltenders have always been considered ‘different’—mainly because the rest of us have never been able to understand why they do what they do!”—was right. Maybe that explains it all!